When I was younger, my mom drilled into me for every holiday, every birthday, and every invitation required a thank you note. It is something that I still carry with me as I approach 30, and have come to hold some strong feelings toward. Through all the years, I always sent thank you cards to family and friends, but realized I was a minority. Yes, people do have busy lives and often forget, but I did take the time pick out the gift, give it to you, and provide a card. 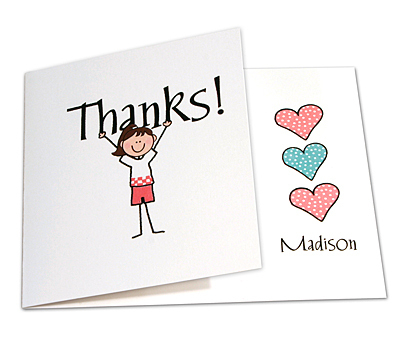 So my position is that even if the adult does not want to take the time, then they should at least make the child send thank you cards out to instill a sense of thankfulness, respectfulness, and a bit of gratitude. You definitely do not want to burn your friends by continually inviting them to your children’s events, without thanking. Start with the date and salutation: Send your note, written in black ink, within a week of receiving a gift. Say thanks right off the bat: Be specific about why you are writing the note. If you’re thanking someone for a monetary gift, refer to their “generosity” rather than mentioning the amount. Compliment the kind gesture: Don’t be afraid to go over the top—everyone loves an effusive compliment, as long as it’s heartfelt. Allude to the future: Anticipate another get-together, or if you’re writing about a gift, be sure to tell them how you plan to use it. Still worried about wording? Visit here. It generates samples based on the event. A personalized drawing card especially for younger children, is a cute way to thank family members and close friends from a child. Also , children’s calling cards would work for any occasion and can be used throughout the years. 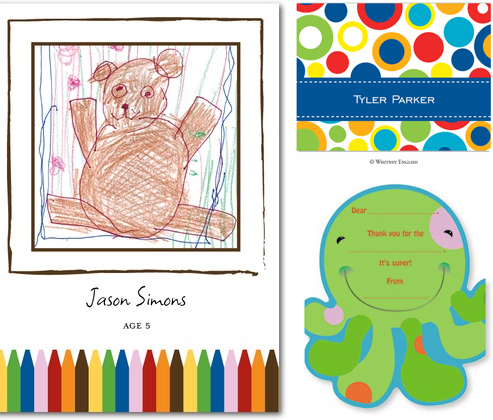 Personalized drawing card TinyPrints.com from $1.89 ea. Calling Card InvitationBox.com. from $1.34 ea. Octopus Cut out MyExpression.com from 62¢ ea.